Nixon was born in 1899 and with little education had become a Pullman car porter and in 1928 joined the Brotherhood of Sleeping Car Porters Union, the first union led by an African American, A. Philip Randolph. Nixon would later organize the Montgomery branch of the union and lead it for many years. From that labor platform, Nixon would build both the local NAACP chapter and then the Montgomery Improvement Association (MIA) which would be the launchpad for Martin Luther King’s career. In his later years, King would become an avowed socialist, saying to aides, “we are saying that something is wrong with capitalism. There must be a better distribution of wealth, and maybe America must move toward a democratic socialism.” When he testified before Congress in 1966, he talked about economic inequality and capitalism driving the hopelessness of the urban black poor. “We can’t end slums in the final analysis without seeing the necessity to take profit out of slums,” he told the Senators that day. His turn to building the Poor People’s Campaign in 1968 was specifically about moving the civil rights movement toward fighting for economic transformation of society- and he had Michael Harrington, who would become the main leader of the Democratic Socialist Organizing Committee, draft the Poor People’s Manifesto that outlined the campaign’s vision. 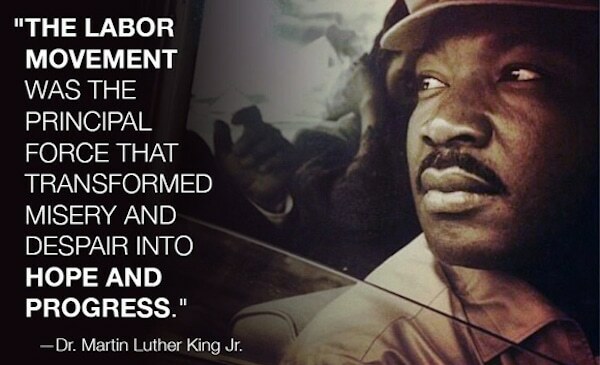 So don’t just celebrate the sanitized “secular saint” version of King promoted by the media but remember his radical vision – and the socialist labor activists that strengthened his work and amplified his voice throughout his career.